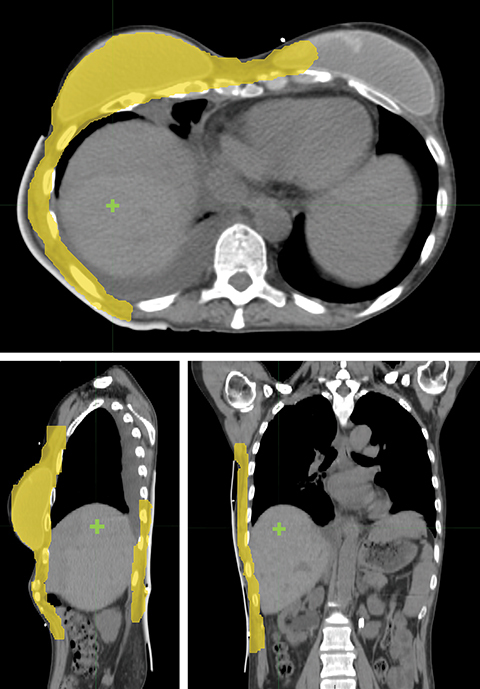 In this report, we describe a static IMRT treatment planning technique for a large-field recurrent chest wall irradiation with concurrent hyperthermia. The patient was diagnosed at age 38 with stage III (at least cT3N1) moderately differentiated invasive ductal carcinoma (ER/PR/HER2+) of the right breast. After neoadjuvant chemotherapy with dose-dense doxorubicin and cyclophosphamide followed by docetaxel, the patient underwent a double mastectomy with reconstructions (ypT3, yN1mic, M0). 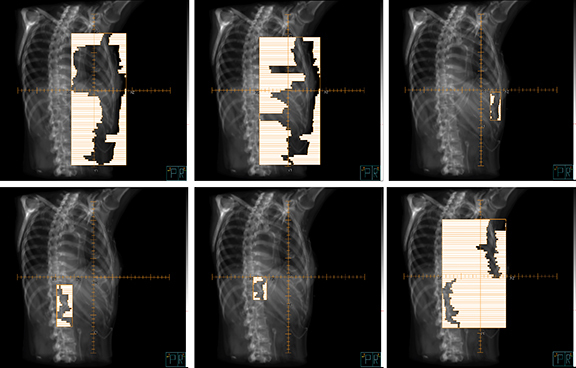 In her initial radiation treatment, the patient received 50 Gy in 25 fractions to the right chest wall, 46 Gy in 23 fractions in the supraclavicular and axillary regions, and 10 Gy in 5 fractions to the scar. The patient completed 1 year on trastuzumab. She then underwent oophorectomy and completed 5 years on anastrozole. At age 44, the patient presented with a chest wall recurrence with widely metastatic disease involving her liver, retroperitoneal lymph nodes, brain and bones. To manage her metastatic disease, she received whole-brain RT (30 Gy in 10 fractions) and systemic treatment with pertuzumab, trastuzumab and docetaxel. She responded well to systemic treatment and had only minimal disease in her visceral organs, but the chest wall recurrence continued to progress. She was then referred for palliative thermoradiotherapy to her chest wall disease. At this point, her right chest wall disease extended superiorly to the clavicle, laterally wrapped around her side to her back, and inferiorly involved the skin overlying her upper abdomen. Her IMRT radiation plan is described in this report. While she was receiving hyperthermia and radiation to her right chest wall, she developed an isolated recurrence in her left chest wall, which was treated with a separate electron field. During thermoradiotherapy, she stopped taking docetaxel, but continued with pertuzumab and trastuzumab. Considering the large target volume and toxicity, the patient was prescribed with 46 Gy in 23 fractions for ReRT along with HT twice a week based on previous publications.15 The planning target volume (PTV) included the right breast and chest wall with a total volume of 1711.42 cm3 (Figure 1). Step-and-shoot IMRT was planned on an ARTISTE machine (Siemens Medical Solutions, Malvern, Pennsylvania) using Pinnacle3 treatment planning system R9.6 (Philips, Andover, Massachusetts). As shown in Figure 1, the isocenter was placed at the right lobe of the liver. Nine 6-MV photon beams were set up at angles from 30° to 190° with 25° spacing in between (Figure 2). A 5-mm bolus was wrapped around the right side of the patient to ensure superficial target coverage. The plan was optimized using the direct machine parameter optimization (DMPO) method with final optimization objectives listed in Table 1. For the Max equivalent uniform dose (EUD), the parameter a was set to 1, making the EUD equivalent to the target mean dose. The plan was done in a “warm start” fashion, meaning the planning objectives were added and adjusted in multiple trials without resetting beams in between. In Table 1, “Ring” represented a planning tuning structure, created by expanding the PTV by 1 cm and then subtracting the expansion from the external/patient body. The “5000 Hot Spot” represents a structure converted from the isodose line of 5000 cGy. To cover the large field sizes and achieve an adequate level of intensity modulation, jaws were allowed to move during the treatment. The beams had 7 to 11 segments each, and Figure 3 is an example beam’s eye view with 6 segments (gantry angle 215° shown). 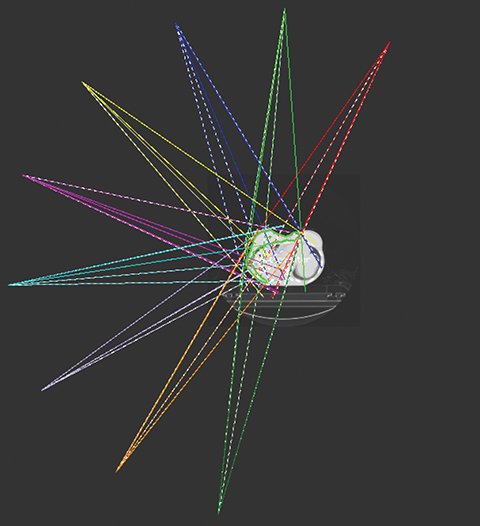 The plan had a total of 999 MUs per fraction with a delivery time (beam on time) of 25 minutes. 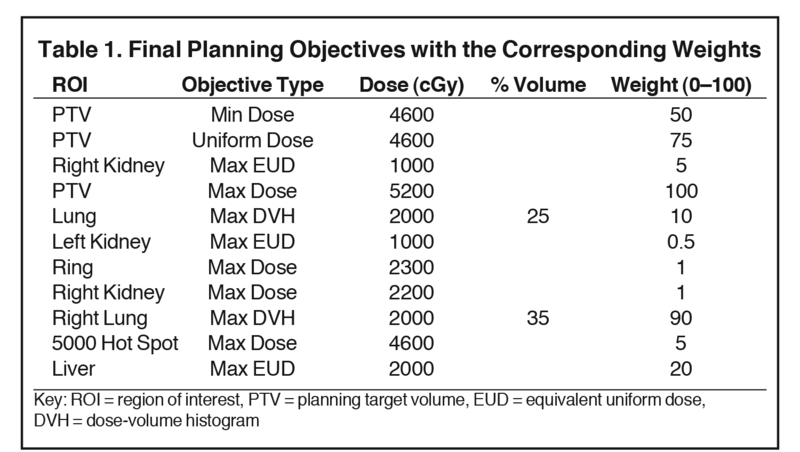 As shown in the dose-volume histograms of the plan (Figure 4), volume of the PTV receiving the prescription dose was 95.65%. 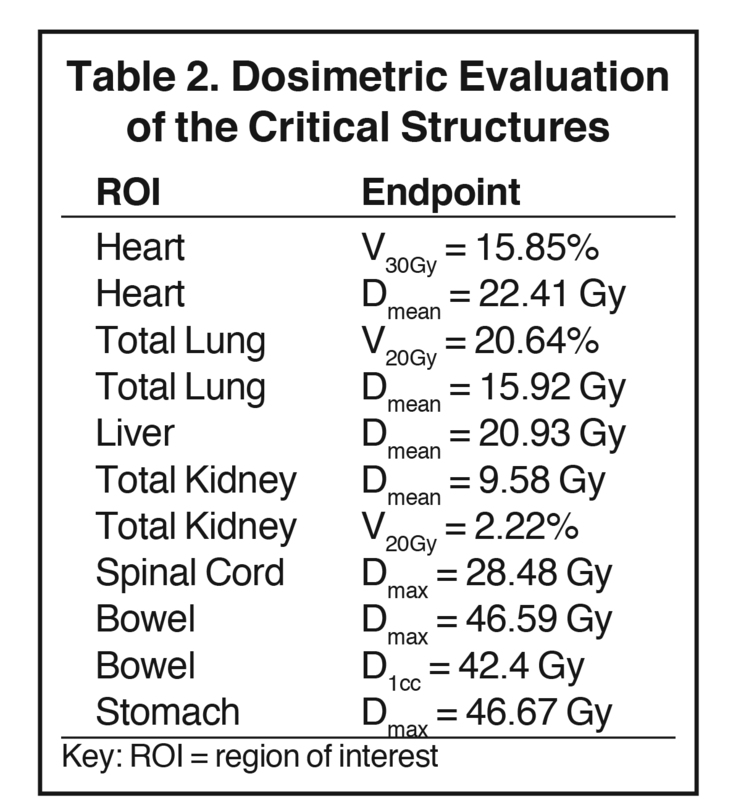 Table 2 summarizes the dosimetric endpoints to the critical structures, and Figure 5 shows the isodose distributions. where, D max(0.03cc) is the maximum dose to a 0.03 cm3 voxel, and D Rx is the prescription dose. Based on this equation, the dose is calculated to be more homogeneous as the HI approaches 1. Here, TV is the target volume, V Rx is the volume that receives the prescription dose. A CI close to 1 indicates good plan conformity. In this plan, the HI and CI for the PTV were calculated to be 1.12 and 1.09, respectively. Treatment planning for chest wall ReRT, especially with a large-volume irradiation, can be challenging. Similar challenges exist in treatment planning for bilateral breast cancer and chest wall irradiation with the internal mammary nodal (IMN) involvement. Bechham et al reported their treatment planning technique using multiple static IMRT fields to treat the left breast and IMN with 50 Gy in 25 fractions.11 Using a different treatment planning system from what we used in this report (Eclipse, Varian, Palo Alto, California), they found that 9 to 11 equally spaced IMRT beams within a 190° span were sufficient, resulting in better dose sparing of the heart and lung. They reported that the average V30Gy to the heart was 1.7%, and V20Gy to the left lung was 17.1%, compared to 12.5% to the heart and 26.6% to the left lung from the standard 3-dimensional (3D) plans. As a result of using multiple IMRT fields, however, more healthy tissue received low doses. Kaidar-Person et al16 described their clinical experience of using helical tomotherapy in 9 patients with bilateral breast cancer with regional nodal involvement. The prescription dose to breasts/chest wall ranged from 40 to 60 Gy. They reported that the average V20Gy to both lungs was 29% and average mean dose to the heart was 20 Gy. Clinically, they reported acute toxicity during radiation, including dysphagia (5/9), fatigue (4/9), nausea and weight loss (1/9), and skin desquamation (9/9). The authors speculated that these observed acute toxicities were likely related to the relatively high volume of normal tissue irradiated. Thus, they recommended conventional 3D techniques (such as bilateral tangents, matching electron fields) prior to the initiation of IMRT/VMAT/tomotherapy. Dumane et al17 recently reported on a case of using VMAT (50.4 Gy) for a left-side chest wall and regional nodal radiation, comparing the partially wide tangents technique (PWT) and the mixed photon and electron technique to the VMAT technique. Using the PWT plan, the mean heart dose was 13.6 Gy and the ipsilateral lung V 20Gy was 56.9%. 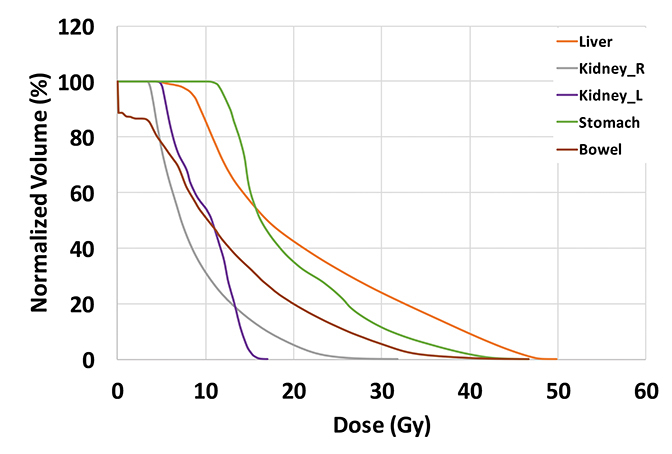 Using the mixed photon and electron plans (20:80 or 30:70 photons to electrons), the mean heart dose was 12.1 to 12.4 Gy and the ipsilateral lung V 20Gy was 56.8% to 60.8%. Using the VMAT plan with 2 partial arcs of range 210° (from 300° to 150°), the mean heart dose was 6.4 Gy and the ipsilateral lung V20Gy was 27.2%. Similar to Bechham’s study,11 Dumane et al reported that the volume of the total lung receiving low dose increased; in particular, V5 Gy to the contralateral lung increased from 0% to 15.8%. Kirova et al18 reported on a postmastectomy conformal electron-beam radiation therapy technique. In this technique, the chest wall and IMN were included in 1 electron field at a gantry angle of 20° to 30° from the vertical, with a prescription dose of 50 Gy and a photon boost up to 5 Gy to the IMN. Different bolus thicknesses were used to achieve adequate penetration and dose homogeneity. As reported by the same group,6 for over 700 patients treated with this technique, the 5-year locoregional recurrence-free survival and overall survival were both over 90% with minimal short and long-term toxicity. HT is a well-established radiosensitizer, which provides dosimetric advantages especially in ReRT settings. A published randomized trial19 showed that with a median dose of 41 Gy (range, 18 to 66 Gy) for patients with prior RT to superficial tumors, CR was 68% and 24% for HT and non-HT arms, respectively. Given the radiosensitization of HT, a lower prescription dose (46 Gy in 23 fractions) compared to other studies was prescribed for the patient described in this report. In our institute, hyperfractionation (1.2 Gy, twice a day-BID) is considered as an option to decrease side effects for patients who had bad reactions to their first course of RT. However, the benefits of hyperfractionated concurrent HT-RT are not clinically proven. For most patients, BID treatments are not practical. Therefore, as seen in this case, conventional fractionation is more common. Unlike the typical volumes in chest wall and regional node irradiation, target volumes for recurrences in the chest wall are more irregular and variable. As shown in Figure 1, the target volume for this patient on the right side wrapped around her chest wall to the posterior, inferiorly extended beyond the kidney, and laterally crossed the median sternum. We used the electron beam to treat the isolated recurrence on the left chest wall. The more extensive tumor volume on the right chest wall was treated with 9 step-and-shoot IMRT fields concurrent with hyperthermia to boost tumor radiosensitivity. Dosimetrically, V30Gy of the heart was 15.85% and the mean dose to heart was 22.41 Gy. V20Gy of the total lung was 20.64% and the mean dose to the total lung was 15.92 Gy. For this patient, the main dose-limiting organ at risk (OAR) was the lung, along with other organs such the liver, kidney, stomach, small bowel and heart. According to the Quantitative Analysis of Normal Tissue Effects in the Clinic (QUANTEC) summary,20 mean dose to the heart < 26 Gy and V30Gy < 46% are associated with < 15% pericarditis, and mean dose to the lung < 20 Gy and V20Gy < 30% are associated with < 20% symptomatic pneumonitis. The plan follows these recommendations to minimize acute heart and lung toxicity. In this case, it was not practical to use matching electrons or tangential photon beams due to the large target volume. For this patient, we used the ARTISTE, a Siemens linear accelerator, for its large field size (40-by-40-cm modulated field) and 0.5-cm multileaf width. Similar static IMRT techniques can be applied to Varian and Elekta (Stockholm, Sweden) linear accelerators. Despite the VMAT capability on Varian and Elekta treatment machines, we believe that the static IMRT technique has advantages over VMAT technique for the following reasons. 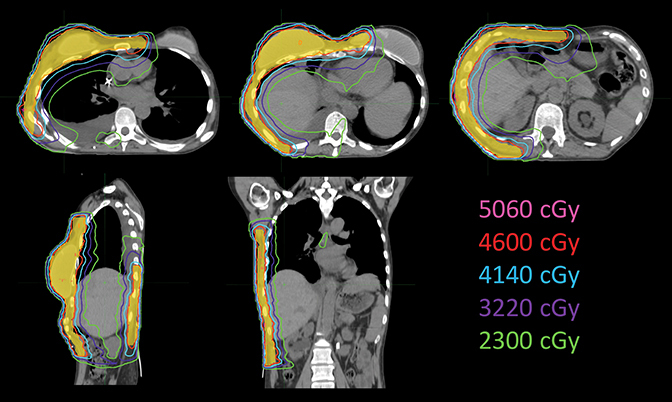 For this patient, the maximum tumor dimension projected from some beam angles exceeded the maximum field width for non-TrueBeam Varian machines (29 cm width and 40 cm length). With the lower jaw (x jaw) fixed on 29 cm, a part of the tumor volume was only exposed to certain beams but not all beams. Therefore, static IMRT technique enhances the flexibility for optimization, increasing beam intensity modulations and beam weights for those beams that can encompass the entire tumor volume. Without jaw tracking capability on the non-TrueBeam Varian machines, the jaws for the VMAT plan remain open to the largest field size for the arc beams, increasing leakage from the MLC. When planning for large tumor volumes, even with Varian TrueBeam machines, we frequently encounter problems with the 15-cm distance limit between the MLC leaf separation from the same leaf bank, on the carriage motion limit. Moreover, the current implementation of VMAT delivery only allows 1 segment per beam angle, which requires a large arc length to increase the intensity modulation for a VMAT plan. For this patient, using a full arc could further increase the total lung dose and heart dose. For these reasons, static IMRT was preferred to VMAT despite possible extended treatment times/length. The patient tolerated her hyperthermia and radiation well. She developed acute grade II radiation dermatitis that was treated with conservative measures. She had a complete response to hyperthermia and radiation within the treated area. She resumed hormone therapy. Six months after her hyperthermia and ReRT, she developed new dermal metastases outside of the irradiated area. She also progressed systemically and, therefore, went on to chemotherapy. She was ultimately enrolled in hospice care 2 years later. Early Breast Cancer Trialists’ Collaborative Group (EBCTCG), Darby S, McGale P, et al. Effect of radiotherapy after breast-conserving surgery on 10-year recurrence and 15-year breast cancer death: meta-analysis of individual patient data for 10 801 women in 17 randomised trials. Lancet. 2011;378(9804):1707-1716. Fisher B, Anderson S, Bryant J, et al. Twenty-year follow-up of a randomized trial comparing total mastectomy, lumpectomy, and lumpectomy plus irradiation for the treatment of invasive breast cancer. N Engl J Med. 2002;347(16):1233-1241. Hehr T, Lamprecht U, Glocker S, et al. Thermoradiotherapy for locally recurrent breast cancer with skin involvement. Int J Hyperthermia. 2001;17(4):291-301. Welz S, Hehr T, Lamprecht U, et al. Thermoradiotherapy of the chest wall in locally advanced or recurrent breast cancer with marginal resection. Int J Hyperthermia. 2005;21(2):159-167. Datta NR, Puric E, Klingbiel D, et al. Hyperthermia and radiation therapy in locoregional recurrent breast cancers: a systematic review and meta-analysis. Int J Radiat Oncol Biol Phys. 2016;94(5):1073-1087. Grellier Adedjouma N, Chevrier M, Fourquet A, et al. Long-term results of a highly performing conformal electron therapy technique for chest wall irradiation after mastectomy. Int J Radiat Oncol Biol Phys. 2017;98(1):206-214. Clarke M, Collins R, Darby S, et al. Effects of radiotherapy and of differences in the extent of surgery for early breast cancer on local recurrence and 15-year survival: an overview of the randomised trials. Lancet. 2005;366(9503):2087-2106. Ragaz J, Olivotto IA, Spinelli JJ, et al. Locoregional radiation therapy in patients with high-risk breast cancer receiving adjuvant chemotherapy: 20-year results of the British Columbia randomized trial. J Natl Ca Inst. 2005;97(2):116-126. Wadasadawala T, Jain S, Paul S, et al. First clinical report of helical tomotherapy with simultaneous integrated boost for synchronous bilateral breast cancer. Br J Radiol. 2017;90(1077):20170152. Kestin LL, Sharpe MB, Frazier RC, et al. Intensity modulation to improve dose uniformity with tangential breast radiotherapy: Initial clinical experience. Int J Radiat Oncol Biol Phys. 2000;48(5):1559-1568. Beckham WA, Popescu CC, Patenaude VV, etal. Is multibeam IMRT better than standard treatment for patients with left-sided breast cancer? Int J Radiat Oncol Biol Phys. 2007;69(3):918-924. Müller A-C, Eckert F, Heinrich V, et al. Re-surgery and chest wall re-irradiation for recurrent breast cancer - a second curative approach. BMC Cancer. 2011;11(1):197. Popescu CC, Olivotto IA, Beckham WA, et al. Volumetric modulated arc therapy improves dosimetry and reduces treatment time compared to conventional intensity-modulated radiotherapy for locoregional radiotherapy of left-sided breast cancer and internal mammary nodes. Int J Radiat Oncol Biol Phys. 2010;76(1):287-295. Wahl AO, Rademaker A, Kiel KD, et al. Multi-institutional review of repeat irradiation of chest wall and breast for recurrent breast cancer. Int J Radiat Oncol Biol Phys. 2008;70(2):477-484. Feuvret L, Noël G, Mazeron JJ, Bey P. Conformity index: a review. Int J Radiat Oncol Biol Phys. 2006;64(2):333-342. Kaidar-Person O, Kostich M, Zagar TM, et al. Helical tomotherapy for bilateral breast cancer: clinical experience. Breast. 2016;28(SupplC):79-83. Dumane VA, Ohri N, Green S. Volumetric-modulated arc therapy improved heart and lung sparing for a left-sided chest wall and regional nodal irradiation case. Appl Radiat Oncol. 2017;6(3):28-36. Kirova YM, Campana F, Fournier-Bidoz N, et al. Postmastectomy electron beam chest wall irradiation in women with breast cancer: a clinical step toward conformal electron therapy. Int J Radiat Oncol Biol Phys. 2007;69(4):1139-1144. Jones EL, Oleson JR, Prosnitz LR, et al. Randomized trial of hyperthermia and radiation for superficial tumors. J Clin Oncol. 2005;23(13):3079-3085. Marks LB, Yorke ED, Jackson A, et al. Use of normal tissue complication probability models in the clinic. Int J Radiat Oncol Biol Phys. 2010;76(3, Suppl):S10-S19. Ouyang Z, Xia P, Vassil N, Yu KJ, Yu JS. 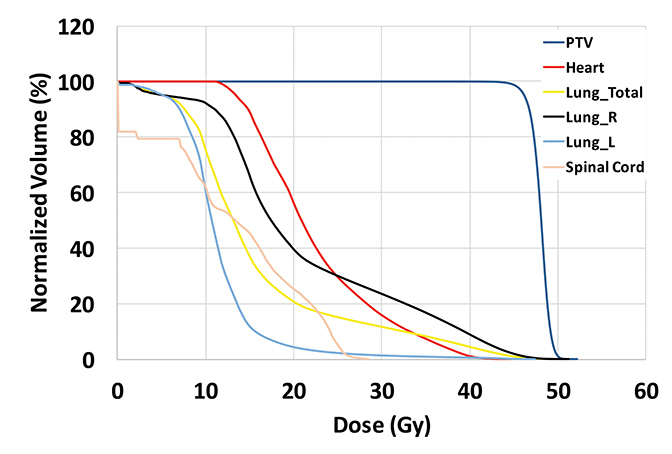 Treatment planning technique for a large-field chest wall re-irradiation using step-and-shoot intensity-modulated radiation ther. Appl Rad Oncol. 2018;7(1):58-63. Dr. Ouyang is a physics resident, Dr. Xia is head of medical physics, Ms. Vasil is a dosimetrist, and Dr. Jennifer Yu is a radiation oncologist, all at Cleveland Clinic, Cleveland, OH. Mr. Kevin Yu is a student at Johns Hopkins University, Baltimore, MD.